Most of us have umpteen social media and networking accounts these days. There are so many of them that it is overwhelming to keep up with them. At least, it was until MyLife.com rolled out. 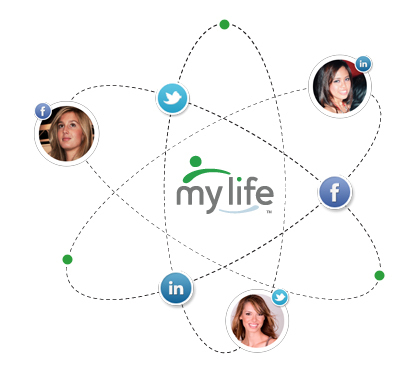 MyLife.com is a new service that lets you manage all of your social media accounts and email in one place. Using LinkedIn, Facebook, Twitter, email and Google+ all in one convenient spot is a time saver. Moreover, doing so makes managing today’s fast-paced social world easier. Rather than systematically checking each account separately, which takes ages, MyLife lets you receive updates from all of them in one spot. LinkedIn focuses on professional connections. Facebook focuses more on personal interaction. Google+ is a combination of both. The problem with each is that it is easy to get away from managing relationships with all the distracting sideshows. Videos, images, games, full-length articles and more often get in the way of status updates, whether important or silly, and pertinent conversations. Twitter is the only one that isn’t inundated with flashy inanity, but it is quite self-centric. The character limit is prohibitive to any real discourse between you and your contacts, especially group discussions. MyLife.com lets you update all four with the same message and only one click. You’ll filter out all of the fluff and be left with the important stuff — this saves time and keeps you in the loop. Finally, a one-stop social media managing tool that works. And one of the best thing about Mylife.com is that they shows who’s actually searching for you. I always wondered If I can see, who’s been searching for me online? Facebook, LinkedIn, and Google+ won’t tell you who has been searching for information about you. MyLife, helps you manage your online reputation by seeing who has been looking for you. 7 Fantastic Ways to Generate Targeted Twitter Followers for Your Business!